Khan’s man: Salman Ahmad (first from left) with Imran Khan. 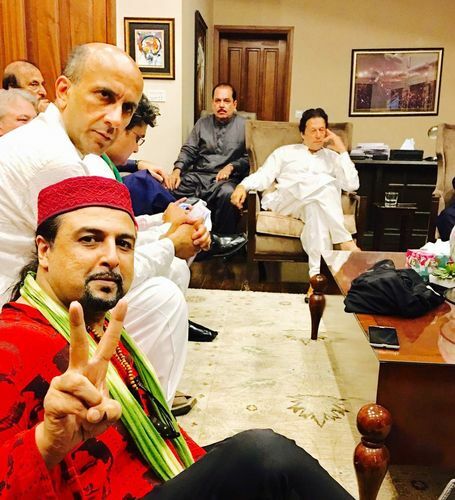 PAKISTANI MUSICIAN Salman Ahmad has been a close friend of Pakistan’s new prime minister Imran Khan since his teenage days. He was part of the Pakistan cricket team that toured Bangladesh under Khan’s captaincy in 1985. In the recent elections, Ahmad was right by Imran Khan’s side; his songs and performances were the defining feature of Khan’s campaign rallies. Ahmad says that for understanding Imran the politician, one has to study Imran the cricketing allrounder. “Most of his natural instincts come from his vast and myriad experiences on the cricket field,” he says. You know Imran Khan since you were both teenagers. Can you share your defining memory of him? Growing up, like millions of young Pakistanis, I, too, was obsessed with cricket. If cricket was an alternative religion, Imran Khan was its messenger of light. During the 1980s, at Lahore Gymkhana and on the 1985 tour to Bangladesh, IK made all of us believe that if you follow your heart and passion, you could do anything in life. I was an impressionable teenager and I took his words to heart. After I graduated from King Edward Medical University, Lahore, as a doctor, I followed IK’s advice and did something which my parents and friends thought was insane—putting down the stethoscope and picking up the guitar. Thirty years later, my life journey as an artist, United Nations goodwill ambassador and social entrepreneur has benefited greatly from Khan sahib’s inspiration. What fills Imran Khan with more passion—cricket or politics? Musician and social entrepreneur Salman Ahmad is the pioneer in Sufi-rock music in Pakistan. With American bassist Brian O’Connell, he started his band Junoon in 1990. He became a social activist in the mid-1990s. He has served as a UN goodwill ambassador for HIV/AIDS awareness in Pakistan. After the disintegration of Junoon in 2005, he became a solo artist. Ahmad has been an active supporter of Imran Khan, though he has not joined Khan’s party formally, yet. If you want to understand Imran Khan the politician, study Imran Khan the cricketing allrounder. Most of his natural instincts come from his vast and myriad experiences on the cricket field. IK is a student of everything he takes on in his life. Failure never fazes him. He is an exceptionally fast learner and sets incredibly high standards for himself. Spending 22 years in the wilderness of Pakistan’s political arena has taught him many things—above all patience, perseverance and positively embracing uncertainty. You have quite literally brought junoon (passion) to the PTI campaign, enthralling the rallies with your music for a naya Pakistan. But, you did not join the party formally. Why? My wife, Dr Samina, and I are social workers at heart. My focus for the past four years has been to help eradicate polio from Pakistan. My mantra has always been to serve. My junoon was to see IK achieve naya Pakistan. Now that we have a dynamic leader, let’s see how the journey unfolds. Your music has always been political, focusing on themes like anti-corruption. What is the first thing you would like to see in the naya Pakistan that Khan has promised? First things should be rule of law, good governance, peace and accountability. Music and poetry are a very powerful vehicle to help bring about positive social change and create awareness for hot button issues like climate change, accountability and peace. Yes, we should certainly entertain people but not at the expense of losing touch with reality. I taught music at Queens College, New York, and most of my students confessed that they get their social awareness from the artists they trust. So, it is a huge responsibility for all of us global citizens to participate in issues we are passionate about. I hope that Prime Minister Imran Khan and Prime Minister [Narendra] Modi can overcome all challenges, find a hal (solution) and start a constructive dialogue towards peace between Pakistan and India. What is the hope you have for India-Pakistan ties under Imran Khan? Does the fact that he is the best known Pakistani on this side of the border create an advantage or an extraordinary pressure? IK listens to all sides of an argument, but he makes his final decisions based on trusted inputs and his inner compass. He enjoys passionate debate. But, if you want to convince him on an issue, you better be prepared with facts and figures. You said you have the space to disagree with Imran Khan, and still support him. Are there specific issues on which you have disagreed and how has he responded to those? Honest disagreement is a sign of progress. Whenever I have had a conversation about conflicting issues like the importance of faith, culture, marriage or even cricket, IK has always shown great patience and insight to understand my opposing views. He inculcates that same spirit of open discussion within Pakistan Tehreek-e-Insaf. There is a sense that the Imran Khan people know personally is different from Imran Khan the politician—that he has to be much more conservative and orthodox in public life than he actually is. For example, his support for the blasphemy laws. Does politics force him to be something he is not? Imran Khan is a leader of 208 million Pakistanis. He understands the huge diversity that exists across cultural, socio-economic, linguistic, gender and political divides. Over 22 years, he has built a movement from the ground up by being one with the people. If an unfair metaphor can be made, he has gradually modelled himself on the legacy of both the Prophet Muhammad and M.A. Jinnah’s leadership. His guiding principles are compassion, peace and justice. Junoon is reuniting after 13 years. What brought that about and is the reunion here to stay? Junoon has always been a force of unity and rebellion across Pakistan. As a band, we feel that the current generation is vital to the future of the country. We want to rock them all and infuse them with hope. We are releasing a new video based on Allama Iqbal’s classic Khudi from our album Azadi. We are rehearsing for a tour as well. India has grave concerns about terrorism; Pakistan calls Kashmir its core issue. Things seem frozen in time. Is there anything at all that gives you hope for a new beginning? I am a passionate believer in the power of the people. In Pakistan during the recent elections, it was the youth and women who helped IK defeat the dynastic leadership of Pakistan Muslim League (Nawaz) and Pakistan Peoples Party. In the subcontinent, if the youth want peace, justice and harmony, they need to speak out. Nothing happens if you do nothing. In 1996, I wrote a song called Ehtesaab (accountability) which has now become an anti-corruption anthem in Pakistan. The recently convicted ex prime minister Nawaz Sharif had banned Junoon during the 1990s for trying to raise the political awareness of the people. But, as recent history shows, music and pop culture is a powerful vehicle for long-term sustainable political and social change. In 1998, when your musical tour to India coincided with India’s nuclear tests, your ministry of culture called you a traitor. When do we see you in India again and what message will you come with this time? In 1998 when the Sharif government accused me of being a traitor, I told the government that we need cultural fusion, not nuclear fusion. Twenty years later, I say the same thing to both prime ministers, Imran Khan and Modi.